There comes a time in every woman's life when she realizes that the dreams she had as a girl are growing farther away in the rearview mirror. What can you do to make those childhood ambitions a reality? 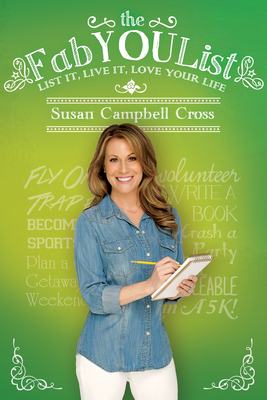 Join author Susan Campbell Cross as she tackles that very question in The FabYOUList: List It, Live It, Love Your Life, an inspiring, humorous and heartfelt story of reinvention. Susan's declaration of, "There are so many things I thought I would have done by now " led her to reflect upon what exactly those things were. Pen and paper in hand, she composed a "wish I had done" list and challenged herself to do everything on it before her 40th birthday. Fly on the trapeze, skinny dip, learn to surf, go church shopping, take guitar lessons, run a 5K, and get a paid acting job, were just the tip of the iceberg. Ironically, the list ended with #40, "write a book." This is that book It's all about how in conquering numbers 1 through 39, Susan transformed her life--and how YOU can, too. The FabYOUList: List it, Live it, Love Your Life invites you along on every madcap escapade as Susan ventures outside her comfort zone and into the adventure of her life, ultimately coming face-to-face with what she discovers has been her biggest obstacle all along--herself. Susan Campbell Cross is a wife and mother from Hidden Hills, California who, since making her "wish I had done" list, has become an actress, writer, and lifestyle expert.